If you’ve ever been to the ocean, you probably have heard the sound of gulls, as they fly back and forth along the shoreline. Many people enjoy the sounds of the ocean and the gulls together. And it is no accident that the Creator has combined these two sounds, the crashing waves, with the gulls. It has a timeless serenity about it. And many have resorted to the healing properties which the ocean seems to have, to heal from some tragedy or loss in their life. To walk along, and stop and sit on a large driftwood, and hear the gulls and the crashing waves, just seems to bring peace to the wounded soul. And beside the sheer beauty of the ocean and the ever-present gulls, th ese birds can be wonderful teachers of spiritual truth! Yes, the Bible says we have… “ten thousand instructors in Christ” 1st Corinthians 4:15. And these gulls, like every other work of God’s wisdom, have aspects about them, that make them living parables, confirming what the Bible already says! HUMAN RACE FIGHTS FOR OUR FOOD! And because gulls are what the Bible calls “unclean beasts”, these gulls also have negative aspects about them! To see the gulls in a frenzy, as they fight for some food, is perhaps somewhat comical. And yet it is an amazing scenario of the human race, as we so often go greedily after the things of the world. Those who work in large corporations can attest to all the back-stabbing and ambitious stepping on the backs of others, merely to get ahead! And to watch an aggressive and dominating seagull begin to peck at the other gulls, until they all tuck in their heads in submission, reminds us the pride and self dominance which humans so often exert over others. THE SEASHORE: WONDERFUL PLACE TO REFLECT! Well, the ocean and the gulls can be a wonderful place for a person to make up their mind to get out of this rat-race which society so often is, and begin to walk up that upward pathway which Jesus has provided! And to walk along the shore-line, as the gulls make their never-ending search for morsels of food, has provided the perfect back-drop for those who might be hungering after God’s love, and for His everlasting life. “When the waves of death compassed me…THE FLOODS OF UNGODLY MEN made me afraid. The sorrows of Hell compassed me about;” 2nd Samuel 22:5. So this passage (and many others too) equates flood waters with the sorrows of Hell, with ungodly men, and with waves of death. And so then, by comparing Scriptures dealing with flood waters, we begin to see just what this Woman of Revelation 12 is fleeing from. Listen to Revelation, Chapter 12… “And the serpent cast out of his mouth water as a flood after the woman, that he might cause her to be carried away of the flood.” Revelation 12:15. As you can see in this sketch to the left, this woman is fleeing from the water which the Dragon is spewing, exactly as it says in Revelation 12. And so, by looking at various related Scriptures, we begin to understand just what this wave of water represents. This Woman of Revelation 12 is fleeing from ‘waves of death’, from ‘sorrows of Hell’, and from ‘floods of ungodly men’, as stated in Psalm 18:4. In Revelation, the Dragon of Revelation 12 is described as having seven heads, ten horns, and seven crowns. 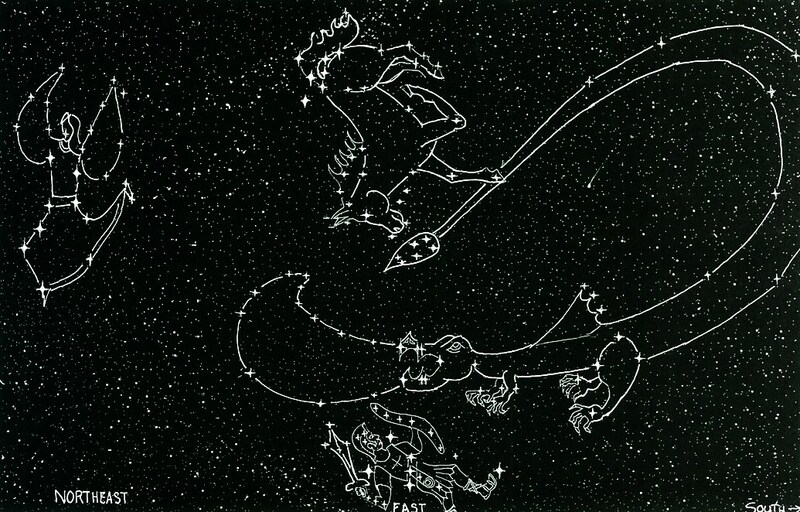 However, the Dragon of Revelation 12 Constellation up in the night sky does not. But God has faithfully created this wave of water, in such a way, as to illustrate this same concept of the seven heads, ten horns, and seven crowns. Because this wave of water is basically comprised of ten stars. The main body of the wave has seven stars (#’s 1 thru 7, in the sketch), and the tip of the crest of the wave has the other three stars, (#’s 8, 9, 10). So in this wave, we see the same 7/10 numbering found in the Revelation description of the heads/horns/crowns of the Dragon. And this gives us a great clue, as to where in the Bible we should look, to find out the riddle as to just what or who do these 7 heads, 10 crowns, and 7 horns represent. Because, the Bible speaks very much about floods and waters as being associated with Satan (the Dragon). Listen again… “When the waves of death compassed me…THE FLOODS OF UNGODLY MEN made me afraid. The sorrows of Hell compassed me about;” 2nd Samuel 22:5.